Ah, the great outdoors. While some people see the beauty of trees, clouds, and nature in general, many video producers only see a myriad of potential issues and uncontrollable variables that can negatively impact their footage. Plenty of corporate videos that are shot in outdoor settings do a great job of providing the look and portraying the message desired by the client. But there’s no question that an outdoor shoot is a completely different animal from the controlled setting of a production studio—so videographers and directors must make additional preparations in order to create the video they are tasked with producing. It’s imperative that these preparations begin long before the day of the shoot. That means scouting the shooting location(s) well in advance to get a feel for the types of shots you’ll be getting—even if you’re just looking for a quick exterior scene outside the client’s offices or headquarters. If you’re acquiring footage in a public space, be sure to check to see if you need a permit from a government agency or municipality. In addition to the general weather conditions found at the location (Is it windy? Humid? Exceptionally bright? ), you’ll also want to note other aspects of the area like the terrain, the types of vegetation (or lack thereof), and the presence of bugs, birds, or other animals. You should also use your ears to ascertain whether you might have to deal with stray sounds from traffic, passersby, or other businesses. If possible, it’s recommended that you scout a particular location at different times of the day. That’s especially true if your video script calls for varied or mood-setting lighting conditions. And if there are powerful artificial lights at the location (such as stadium lights or bright spotlights), be aware of the light color change that will appear in your shots. While scouting, try to envision what the area will look like on shoot day when all of your equipment, talent, and production staff will be there. Will you have adequate sources of electrical power? Where will the spare equipment be placed? Is there a spot where the client’s representatives can relax, or will they be forced to stand out in the heat or cold for hours while you set up or change shots? Before you end your scouting trip, take the time to formulate some contingency plans. Is there a backup shooting spot in case of inclement weather or some other unexpected problem? Can you rearrange parts of your shooting schedule in the event of too much or little sunlight or excessive wind? You can’t control every element of the shoot, but you can make a Plan B for almost any situation if you put in enough effort. The most obvious challenge to deal with on an outdoor shoot is getting the ideal lighting for your shots. After all, you don’t have the most stringent control of your lighting conditions like you do in the comfort of your studio. If perfect lighting is your goal, then you might want to start or end your shoot during “Golden Hour” conditions for the most important shots. But if your video mainly consists of talking heads or simple activities, then ideal lighting conditions may be less vital—and you may be better off tweaking your lighting to match your shooting schedule rather than the other way around. Of course, you’ll need to adjust your camera settings to maximize the quality of your outdoor shots. Turn off (or work with) the automatic exposure setting, and consider whether to lock the exposure or iris while shooting. It can be difficult to see if all your shot elements are in focus using only a camera viewfinder outdoors, so work with your depth of field to get the exact balance you want. Finally, you have the option of using a wide-angle lens for vista shots or increasing the shutter speed to leverage the abundance of light in a given shot. If there is any sun to speak of, you’ll need to affix neutral density filters to your camera lens so that your shots aren’t overpowered by brightness. You may also want to utilize diffusion panels to soften the sunlight that will illuminate your shot. To reduce glare in your shots, consider using a polarizer on your camera lens. 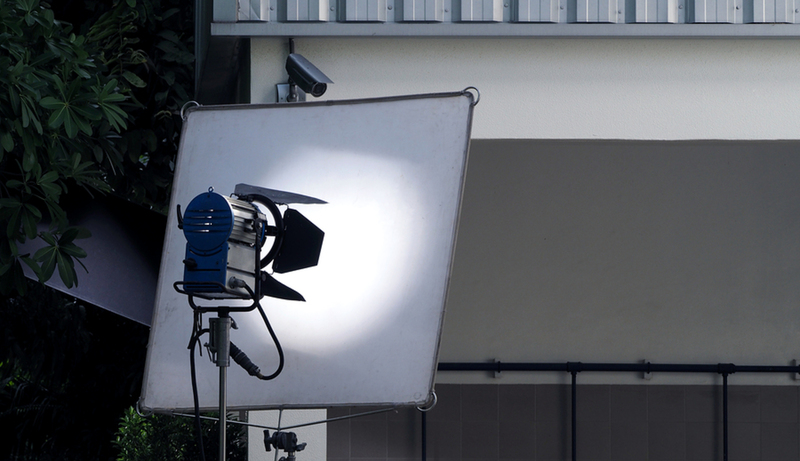 Almost every outdoor shoot scene can be improved using reflectors, flags, or similar light-redirecting tools. Putting a reflector next to the camera can bounce sunlight onto a person’s face and eliminate unwanted shadows, especially if the sun is behind the subject. Use flags to block camera flare-producing light or to cast shadows in strategic parts of your shot. Preparation becomes even more important once the day of your shoot arrives. Check the weather forecast to see if you’ll have to take precautions for precipitation or windy conditions. Extra batteries, power cords, cables, headphones or earbuds, connectors, and camera bags or cases are a must since you probably won’t have an opportunity to run back to the studio to grab a replacement for a malfunctioning piece of equipment. Also, take a moment to consider your audio. Will your shotgun mic or handheld boom mic be sufficient, or will you need other types of microphones? If any wind or rain is expected, windscreens or wind socks should be included in your gear. Placing mics in plastic bags is fine for storage purposes; but if you use them while recording, you’re likely to pick up sounds of crinkling or raindrops on the plastic. Even if you have an ample crew, it’s still wise to pack a number of stands for reflectors, flags, and other equipment. After all, arms get tired and shaky when forced to hold large pieces of fabric for a long time. Finally, be sure to bring plenty of gaffer’s tape, lens cleaners and brushes, a knife or box cutter, and some screwdrivers and pliers. Sure, outdoor shoots may not appeal to video producers who prefer the “security blanket” of their studio. 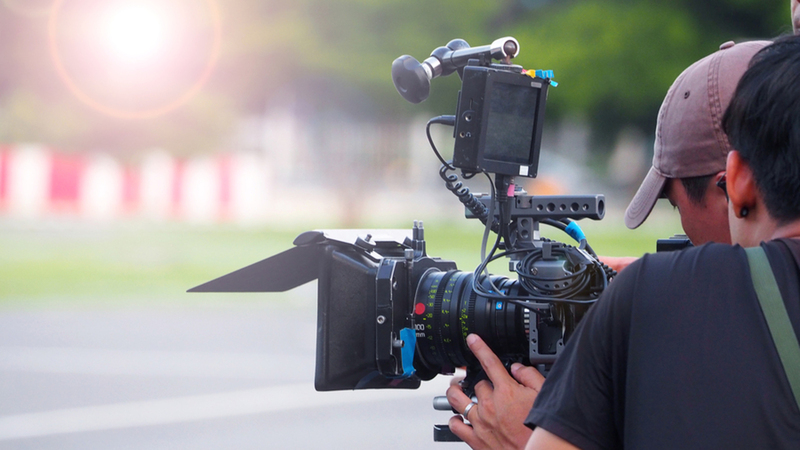 But with some strategizing ahead of time and a willingness to adapt to the forces of nature, you can capture the footage needed to build an attractive corporate video. Need a crew for an outdoor shoot? Contact us today!